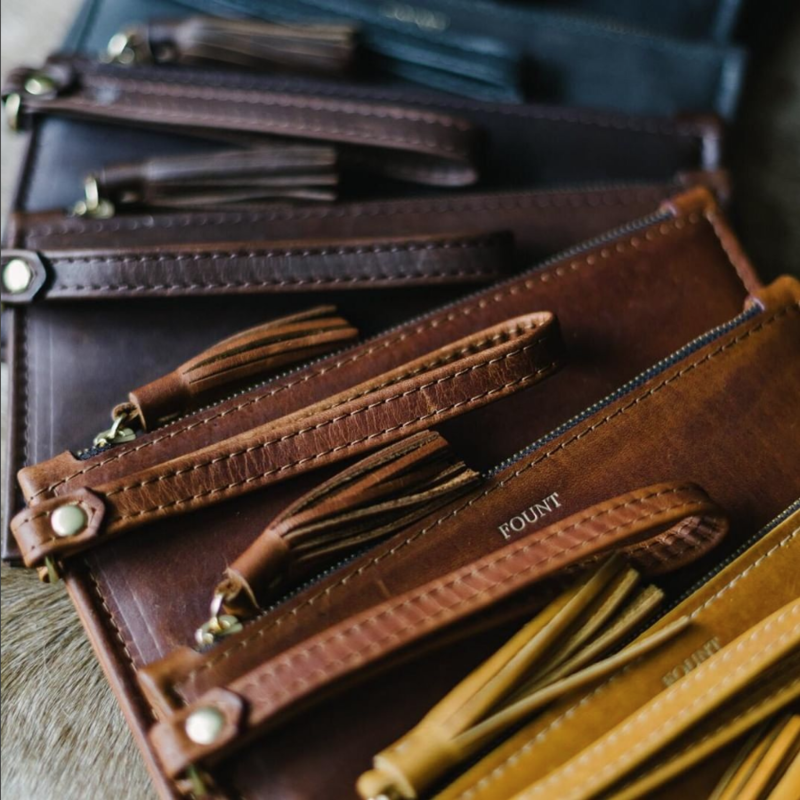 This week, we’re interviewing FOUNT owners and leather crafters Jackie and Phillip Wachter. 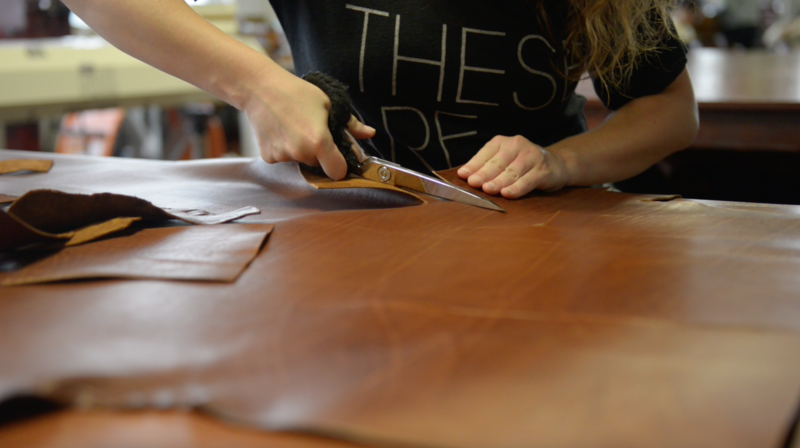 The husband and wife team started sewing for each other, but their brand has grown to provide premium, handcrafted leather bags in and beyond their hometown of Cleveland, OH. 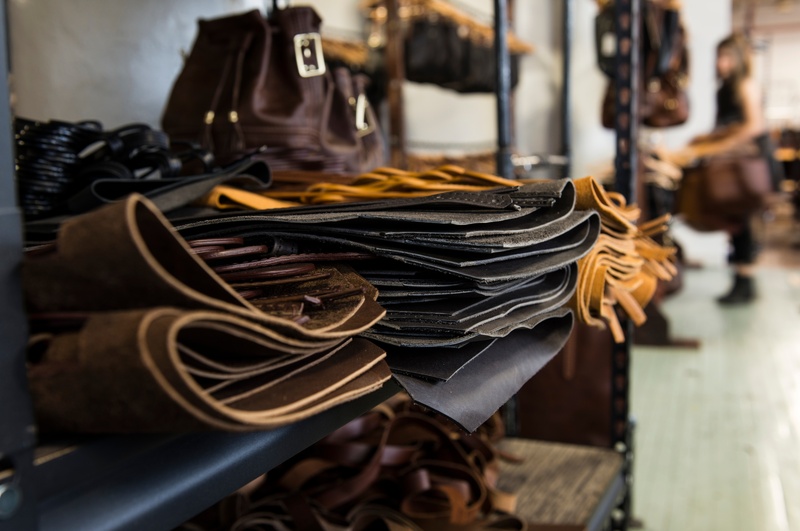 Jackie and Phillip source fine leathers for their products, as well as strong thread, leather crafting machines, and other sewing supplies. 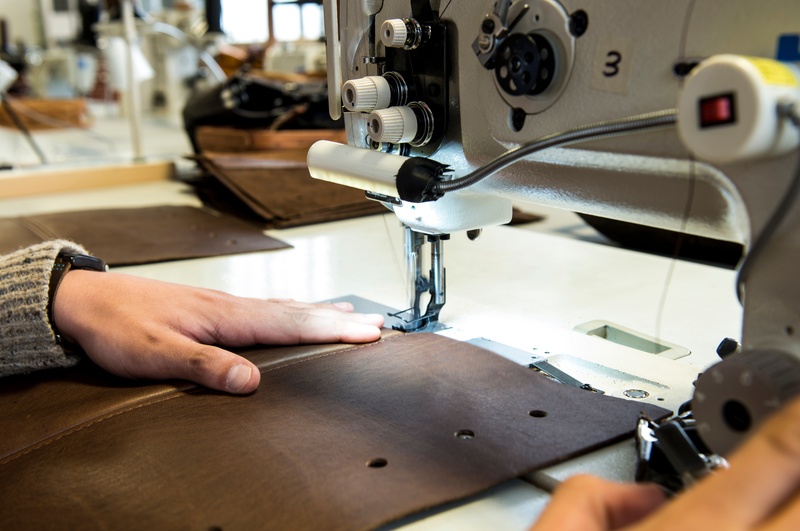 If your brand sells to makers who sew with leather, this 1-on-1 interview with the FOUNT team will give you insights you need to connect with makers like them. Phillip (P): Hi, my name is Phillip Wachter and this is Jackie Wachter, and we are the owners and creators of FOUNT. 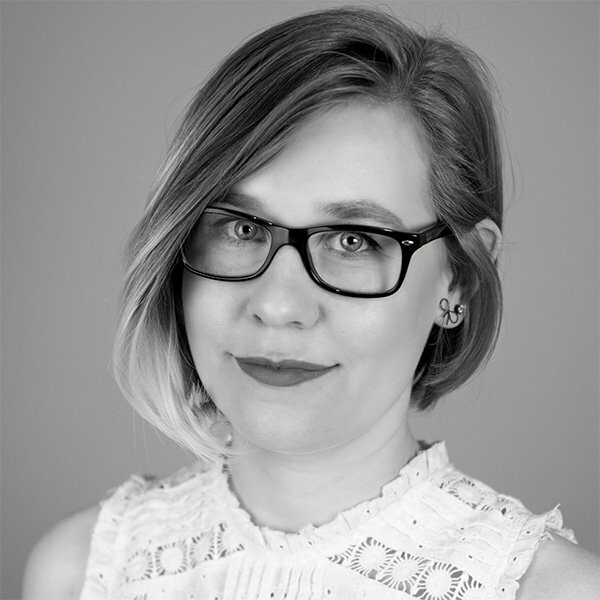 Jackie (J): At FOUNT we design and sew all leather handbags in house. We use fine Italian leather and American leather to create assessable luxury handbags and accessories. When did you start making bags? P: We actually just turned three as a company. So a little over three years ago, we started making wallets out of our apartment in Cleveland Heights. From there we started selling to Cleveland Flea, and we launched our website and Instagram and Facebook, and we were able to kind of keep growing. Eventually, we moved out of the apartment and moved in to the studio space we are in now. J: I went to fashion design school, and Phillip grew up in a very artistic family and had been sewing since he was little as well. We both were interested in design, but neither of us had ever worked with leather. So we kind of self taught ourselves how to design with leather and are still to this day just constantly learning about new machines and new and different techniques for sewing leather. What was it like experimenting to discover your process? J: We used to joke that normal couples, when they first start dating, go bowling or go to the bar and we just stay in our apartment and design leather stuff. P: We’re project people. We really like to be busy, we like to be making things, creating things. It started out we were just making gifts for each other for Christmas. It was the first year we’d been dating. Our first Christmas, we just made gifts for each other. J: Yeah, simple things out of leather, like we started with wallets and things like that. The, we got commissioned by our friend’s mom to design her a bag for Christmas. It was covered in fringe and was a very bohemian style bag. She loved it, and we called it the Nicole. It was really cute, but we decided we wanted to make a bag that was more assessable to every woman and not so trendy. So then we designed our tote. The goal of designing the tote was to design something that would last a lifetime. Every bag I have ever had the straps break on, so our goal was to design an indestructible bag. More specifically, a bag with indestructible straps. To this day, we have sold nearly 6,000 of our totes and never had one single strap break. How do you control the impressive quality of your bags? J: It’s really exciting because the technology we designed, it’s all hand sewn and there is an interior weight-bearing piece sewn inside that makes it incredibly durable. Even our largest tote, you can fill it full of bricks and they can’t break. P: So a lot of handbags now are sewn on a sewing machine. Some machines are good, but something that has been kind of lost in the leather goods market is actually physically hand sewing using two needles going back and forth, doing saddle stitch. And a saddle stitch is three times stronger than a machine stitch, and if the thread were to break, it wouldn’t unravel. We wanted to try to incorporate at least some element of hand sewing into our bags. How do you source the materials and tools you use? P: With the materials we use in our products, we really do search the world over to find the highest quality materials we can to construct the bags. We try to use the highest quality strength and quality techniques that we can to assemble them. J: So we construct our bags from the finest materials you can source. It’s all genuine, full-aniline Italian leather. It’s very different from the leather that most companies are using. 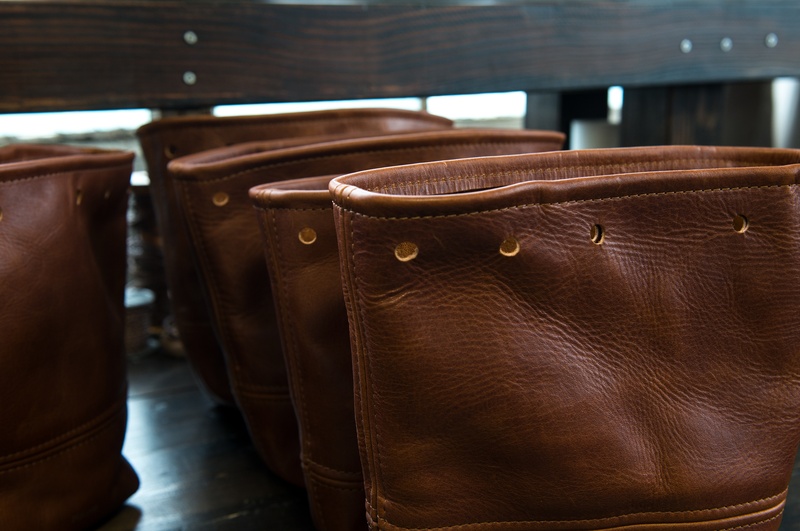 Our leather is free of top coating. Most leather eventually is going to crack, or you’ll see the corners rub off as the paint rubs off the leather. However, our leather is tan, so color is permeated through the leather so it will never wear off. It’s covered in a beeswax and hot oil finish. P: Since it’s a full grain leather, it breathes a little bit. You get this amazing aroma that comes off of it and it basically, the pigment is on the actual hide and from there it has this fantastic wax and oil solution that ages beautifully. And it’s some of the best leather in the world. The tannery we work with is an 8th generation tannery. They have been around for 160 years. They designed leather for Ferrari in the 60s and 70s. They have worked with a lot of these other brands and when we first started FOUNT we got these samples from all of these tanneries from around the world. This tannery had such beautiful leather, we were like we got to use this. In terms of other materials, we use solid brass hardware. That’s kind of our signature, we love brass, it is a great look. We have been able to work with is this zipper company based out of Los Angeles. Our zippers are probably 98 percent made right there in Los Angeles. And they are some of the best zippers in the world. Again, we sourced zippers from probably 18 or 19 different companies and in the end we were really happy and really proud of our choice. J: People don’t really realize how hard it is to actually source things. That is a big part of the process, finding really high-quality materials to use in your designs. So additionally, we have invested in a lot of different machines. We started with just hand tools, and then we bought sewing machine after sewing machine, one at a time until we worked up to what we currently have. P: I think we have nine sewing machines. Pretty much as the need is there we will add one or two more sewing machines to the production process but right now that seems to keep us at a good pace and we might get some more by the end of the year. There is this rich history in the garment industry right here in Cleveland, so we have become friends with some of these different guys who have been able to point us in the right direction as far as what kind of sewing machines to look at, where we can get them from, who are good contacts to work with. How do you define a quality product? J: The reason we picked the word FOUNT to name our company is that the definition means “an abundant source of desirable quality”. That’s what we wanted the essence of our company to be. And every one of our products does have a lifetime warranty on it for that reason. We want people to have investment pieces. Our society has become so disposable, and our goal at FOUNT is to step out against that and do our part to stop the fast fashion industry and to give people a different option. P: It really is funny how just trying to make a quality product really does separate you from rest of the crowd. People get really excited about it. Milton Hershey had this quote where he said, “Give them quality; it’s the best form of advertising or marketing,” and it really seems to be true. We want to make something that we can be proud of, that our team can be proud of, and then the folks that buy our bags, they can be proud as well. 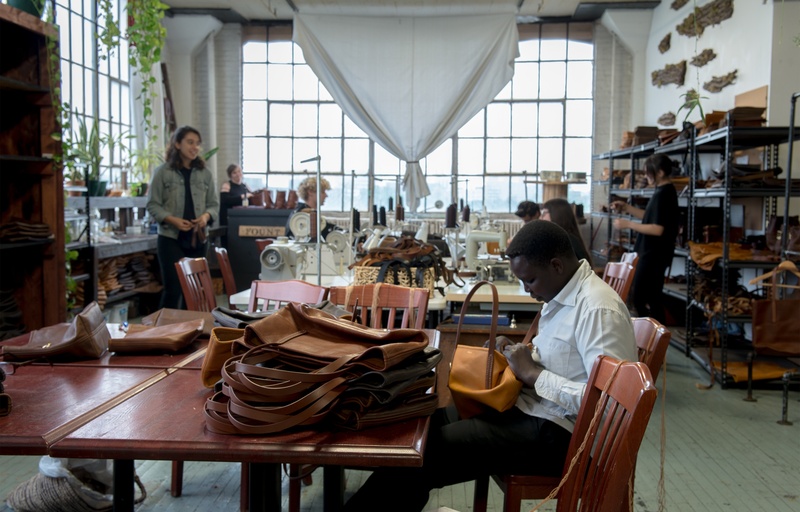 What does the process look like to make a new bag? J: One thing that is very different about FOUNT than most companies is that we design, cut, and sew everything in house. What that means is for our first design, we usually make about 15 prototypes of it. What happens is you come up with the initial design concept. You sketch it out, then you make your first bag. Then there’s always changes to make on that. And then what we will do is one of our girls or guys will carry that bag and see what kind of problems it has. So maybe the straps are too long or too short, or they’re not strong enough. Or the flap gets kind of flimsy. So we go back to the drawing board, and we change it and tweak it until we get our design to a place that we are really happy with it and we know we will have no returns. 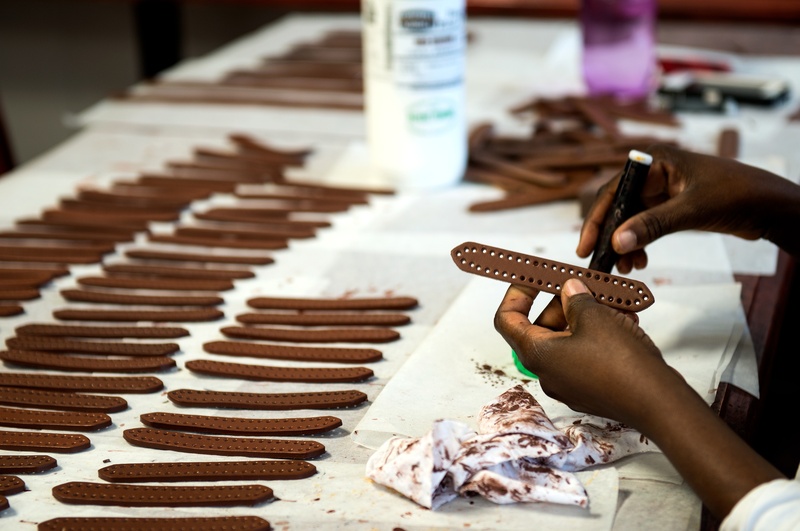 P: From the beginning to the very end we have total quality control over each product that we’re making. That gives us this high standard of what we are producing. J: There are so many steps to making each of the bags. We start with our hides of leather. They do come in huge hides, approximately 60 sq. ft. per hide. We do use fully matured cows, so it’s ethical. They’re part of the meat industry. We unroll the hides and then we will hand pattern in the pieces. Some of the smaller pieces, we will click out on something called a clicker press. It has 15 tons of pressure and so it’s like a giant cookie cutter. It can click out really tiny intricate patterns. After that they are cut out and we will chalk them where the sewing lines are. They then will go to the gold foiling machine and that’s where we will add “FOUNT” to them. If they need holes in them we will click out some of the holes on the clicker press. Then they go to the machine sewing team where they’ll create the pocket, the bag, all of those different pieces. And then if they have hand sewing they will go to the hand sewing station. J: Social media has been huge for our brand, and it is actually how we became a company of this size. So when we first started Phillip and I, we were faking everything. We were just hand-making these bags but we’d use our friends as models and he was the photographer and he made the website. And so we would do these photoshoots and then we created a website and created an Instagram. We were trying to look like a bigger company than just the two of us out of our apartment. P: Instagram has been a huge tool for us as a business. Social media is amazing as free marketing. We are able to show a behind-the-scene look at our brand on Instagram and Facebook. Whether it’s through the photos, the captions, the videos. It has been really fun for us to reach a much wider audience through these platforms. I would definitely say without Instagram or Facebook, I don’t think we really would have been able to launch the brand. How do you connect with other makers? P: One thing that was really big for us early on, Instagram especially, was that we would partner with all of these other people on Instagram. So we found somebody in California, in Seattle, in Connecticut, wherever, and we would partner with them, ask if they would take some photos of our bags. That really helped us grow and helped us grow our audience by doing collaborations with other artists. J: In our area especially, we’re connected to lots different artists, filmmakers, photographers, jewelry designers, potters. I don’t know if it’s like this in every city, but it doesn’t feel competitive. We’re all in this together. 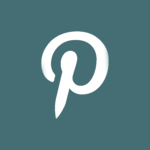 Then on a larger scale, the artist community across the United States, we have worked with lots of different photographers and bloggers, stylists, and models all over the United States. P: In the last eight months, we actually were able to open up two storefronts. On top of that and online sales, we’ll travel and do events around the country to get exposure. We have been able to meet a lot of other makers around the country. We’ve been able to go to these events and meet some really talented people and sell their stuff at our stores as well. J: I don’t look at magazines and different fashion things because I feel like it stunts your creativity a lot. When you follow trends, you know, they are here and gone. Where as we are trying to create a timeless brand. And so what we decided is we want to create bags that people will have for 30-50 years and want to pass on. We want them to be heirloom in quality. P: Basically, when we design something, we’ll talk about the practical side of it. What hole is in our product lineup? What are we not catering to right now? What is a bag style we haven’t done? Then from there we will talk some design styles out. Then we ask ourselves in 10-15 years will this still be relevant as a style? Jackie is the visionary for the more fashion-forward, bold designs. I am more conservative, thinking “What would my mom buy?” Between the two of us we find this great middle ground. J: My favorite part pf the process is the people we work with. We love our team. Bouncing ideas off of them, we have a very young and vibrant group with great design aesthetics and attention to detail. It’s amazing when we put everyone’s heads together how much more creativity there is. When someone says, “What if you did a strap this way? Or you changed the bottom and angled it more like this?”, it helps our whole team be invested in a design we are making. Where do you learn more about what you're doing? P: As we grow as a company, if there are things we need to learn more about, whether it is business things, accounting, or entrepreneurial things, Cleveland has this amazing network of people that we have been able to connect with and talk to and learn things from. J: When we’re making a big decision, we always go to someone smarter than us. It’s important to know that you don’t know everything! We haven’t been shy about asking people like entrepreneurs, “What would you do if you were us trying to make this decision?” Even with our designing, going to some of these places like Amish Country and asking, “Hey, we are having trouble with this design step, what do you think about this?” There are so many people with wisdom who are happy to share it with you. P: When you talk to entrepreneurs that have way more experiences than you, everybody is very open and almost excited to share with you what not to do. They’re like, “This is a mistake I made. Please for all the good things in the world please don’t do what we did.” The internet is super powerful too. It is great to research things. J: The internet is huge for business things like learning about leather or different leather events around the world. And we listen to a lot of podcasts. One of our favorite ones was “How I Built This.” Starting a business is not easy. It is really encouraging to listen to the stories of other businesses because they put it all out there for you. Every big business started small and started with an idea and it takes a lot to get it off of that level. What's the most rewarding part of being a maker? J: Something neat that a lot of people don’t realize is that so many jobs used to be here in Cleveland for manufacturing apparel or accessories. That was actually a huge part of Cleveland’s economy. It wasn’t until about the 80s when stuff started going to places like Mexico, China, or Taiwan. It’s our goal here at FOUNT is to bring jobs like that back to the United States. Also, the fashion industry is a very corrupt industry. And so that is why we are choosing to design here in the United States. Design, cut, and sew here. One of biggest problems in the fashion industry is in the garments or in fabric what happens is leather, fabric, any of those kind of mediums, when they dye them they just put the dye back into the water, so it’s causing problems for the people who are living in those countries. It’s causing different problems like birth defects and fertility problems. So the tannery we work with in Italy, they actually have a video of the owner and he, after the purification process, he actually drinks the water out of a hose. So they found a way to do that ethically. So that’s what we are excited about. Making things that people can be proud of from start to finish.